1. STOP SMOKING: If you are a smoker, with the simple act of quitting you can reduce your chances of suffering lung cancer by 70%. The cigarette is the number one risk factor for lung, mouth, larynx, esophagus, kidney and pancreatic cancer. The good news is that the harm caused by cigarettes is reversible. When you quit smoking, the risk of cancer reduces by half. And after five years, the risk is the same as a person who has never smoked. 2. 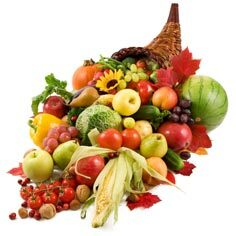 VARY OUR DIET: Increase the consumption of fruits and vegetables. Numerous studies have demonstrated that these foods have ingredients that increase our body’s natural defenses to fight carcinogenic substances. The National Cancer Institute recommends consuming five servings of fruit and vegetables a day, and at least two-thirds of each meal should come from a plant-origin food. The remaining third could be fish, chicken, turkey, cheese or lean meat. Many of us eat the same foods everyday and this decreases our body’s defenses because the more varied our diet is, the more nutrients we provide our body. 3. GET A BIT OF SUN: Recent research report that women who live in sunny areas have less chance of getting breast cancer than those who live in cold areas. One study evaluated 5,000 women over 16 years and reports that those that realized activities in the fresh air had between 30% and 40% less risk of getting breast cancer than their sisters who realized activities indoors. The problem is that we all know that too much sun can lead to skin cancer. Dr. Thomas Jefferson from the University of Philadelphia believes that exposing our face and hands to the sun for a few minutes is sufficient to synthesize vitamin D and protect us against cancer. 4. EAT CRUCIFEROUS VEGETABLES: Cauliflower, broccoli and brussel sprouts have large quantities of chlorophyll, a pigment that traps carcinogenic substances and avoids their absorption in the body. Recent studies report that consuming 750 grams of broccoli a week can reduce the risk of colon cancer by 50%. 5. EAT TOMATOES: Tomatoes contain lycopene, a pigment that is also found in peppers, red grapes and melon. Lycopene helps avoid breast, lung and digestive tract cancer. Men whoconsumer10 servings a week can significantly reduce their risk of prostate cancer. It is not very difficult to consumer the adequate quantity of lycopene a day: two ounces of tomato pure has more than 23 mg of lycopene in a useable form. This amount a day provides a level of protection in our blood. However, tomato juice is a very poor source of lycopene because it cannot be absorbed easily. For this reason, it is recommended to include dishes in our diet that our made with tomatoes or tomato pure, such as spaghetti. 6. CHOOSE THE BEST FATS: Epidemiological studies have associated olive oil consumption with a decreased risk of suffering breast cancer. 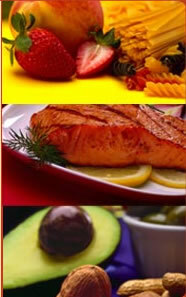 Another type of fat that has demonstrated important benefits is Omega 3, found in salmon, tuna, mackerel and sardines. Other sources include canola oil, linseeds and linseed oil. 7. AVOID CONSUMING ANIMAL FATS AND HYDROGENATED FATS: Such as margarine, mayonnaise and aerosol oils. 8. PAY ATTENTION TO CALCIUM: Scientists have found a relationship between consuming calcium and reducing risk for colon, prostate and breast cancer. 9. DRINK TEA: Green tea contains antioxidants that help avoid cellular damage. A study with 35,000 women showed that those who drink two or more cups of tea a day (green or black), had 40% less risk of urinary cancer and 68% less risk of digestive cancer. 10. FAMILIARIZE YOURSELF WITH FOLATE: Folic acid helps avoid damage to DNA. Folate is found in a natural form in green leaves, wheat germ and legumes, such as beans and lentils. 11. STAY IN SHAPE: Physical activity reduces the risk of colon cancer and helps prevent against breast and prostate cancer. Exercise helps avoid the accumulation of excess estrogen, particularly obese women. 12. LIMIT ALCOHOL CONSUMPTION: Drinking ½ a cup a day increase the risk of breast cancer by 6%, drinking 1-2 cups a day, by 16% and drinking 2-5 cups a day by 40%. 13. AVOID SMOKED FOODS: Excessively cooking meat, such as grilling it, producing carcinogenic substances. If you are going to barbeque meat, marinate it in vinegar and lemon first, as this drastically decreases the quantity of carcinogens that enter your body. 14. CONSUME SOY: A recent study evaluated the application of genistein, a derivative of soy, on the skin of lab mice. Scientists discovered that it inhibited the growth of cancerous cells on the skin after ultraviolet ray exposure. Human tests have shown similar results. 15. EAT PROTEIN: Consuming a diet rich in protein coming from beans, lentils, garbanzo beans, fish and fresh cheese could be an ideal preventive measure to avoid cancer. 16. EAT GARBANZO BEANS: Garbanzo beans are an important source of energy and contain iron, phosphorus, potassium, protein and fiber. They also contain folic acid, vital to preventing birth defects and protecting against certain types of cancer. 17. CONSUME FOODS RICH IN VTAMIN E: Vitamin E is found in vegetable oils, such as corn, sunflower and olive oils, as well as wheat germ, walnuts, peanuts, almonds and spinach. In order to get the recommended 50 mg of vitamin E a day, it is suggested to have a supplement, because to get that from food alone would require eating 2 pounds of spinach or two cups of peanuts a day. 18. THINK POSITIVE: A complete treatment should include the physical, mental and spiritual areas of the patient’s life. The key is to restore and strengthen the interior of a person. What we think, believe and feel can determine our health. The immunological system can strengthen with positive thoughts. 19. LOSE WEIGHT: Dr. George Yu presented six cases of patients with terminal cancer who were administered a diet low in calorie, low in animal fats, rich in vegetables and whole grains, and miso, an ingredient that contains millions of useful bacteria with detoxifying effects. The doctor observed a connection between losing body fat and a decrease in the tumors. 20. EAT ORGANIC FOODS: The key to recovering our health is to return to a natural diet, rich in whole grains and conserve our body, avoiding the use of chemical subtances.